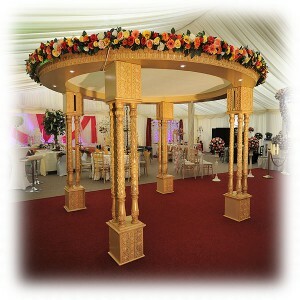 Mandaps are used at many Asian & Indian weddings, positioned at the front of a venue hall or large room on a stage. The mandap is usually ornate and lavish, and can take many different forms. 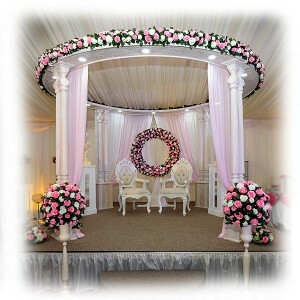 You often find circular wedding mandaps hire or square mandaps which usually have 4 pillars supporting the top. At the same time, larger wedding mandap hire uk are available which can provide a matching backdrop, enabling the overall effect to be dramatic. Mandaps are usually decorated with flowers, lighting and drapes to complete the effect, often tieing with the overall wedding decor that has been decided on. Traditionally, the Indian bride and groom sit underneath the mandap on thrones, and can be joined by immediate family around the mandap if they so wish. The mandap is where the traditional Indian wedding ceremony takes place. Whilst there are a multitude of different mandap designs, it's also true to say that there is a huge range in mandap quality. In other words, like anything else, there are cheap fibre glass mandaps which are produced in bulk, and at the opposite end of the spectrum there are hand made and hand carved traditional mandaps which look spectacular. Mandaps from Event Hire UK are excellent quality, made in carved wood with traditional design, providing you with a fabulous mandap which will look stunning at the front of your wedding occasion. Due to the size of mandaps (they are usually around 7ft tall), they come in sections which will be assembled on site by the Event Hire UK team if you so wish. However, the price you see for the hire is for the whole mandap. And, why not at the same time look to not only hire mandaps but also your Indian wedding chairs, wooden table hire, rent a bar and other furniture hire products as we offer the complete range here at Event Hire UK. Whether you are looking to hire a square mandap or hire a round mandap, the team at Event Hire UK can help. Mandap hire has always been a popular range for Asian wedding planners and Indian wedding planners, with mandaps being one of the essential elements of the wedding ceremony. 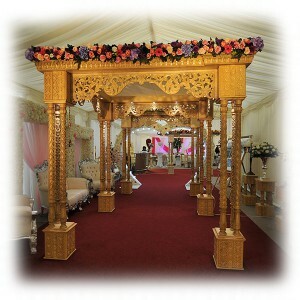 If you want to hire a mandap in Birmingham, London, Manchester or Leeds, for example, then there are plenty of mandap hire companies who will be able to assist you - however, take the time to shop around and find the best design that reflects you and your partner, and one that has the quality of finish that will complement your wedding venue and occasion. Like many things, with the age of the internet, mandap hire is simple - quality mandap hire, however, can be slightly more difficult. The Event Hire UK team are here to make your mandap rental experience as hassle free as possible, from your initial enquiry through to the erection and dismantle of the mandap. Our team work tirelessly behind the scenes when it comes to mandap hire and other wedding furniture hire to ensure that your special occasion is the fantastic success you want - and deserve - it to be.